"No One Has Outlawed Recessions" Stockman Sees S&P Fair Value "Way Below 2000"
"If you're a rational investor, you need only two words in your vocabulary: Trump and sell," says David Stockman, former President Reagan's Office of Management and Budget director, warning that a 40% stock market plunge is closing in on Wall Street. While not the first time Stockman has warned of a catastrophe waiting to happen in markets, he told CNBC's Futures Now that, after the worst monthly loss for global stocks since the financial crisis, that the early rumblings of that epic downturn are finally here. "fair value of the S&P going into the next recession is well below 2000, 1500 - way below where we are today." "He's attacking the Fed for going too quick when it's been dithering for eight years. The funds rate at 2.13 percent is still below inflation,"
"The trade war is not remotely rational," he said. If the dispute worsens, it "is going to hit the whole goods economy with inflation like you've never seen before because China supplies about 30 percent of the goods in the categories we import." 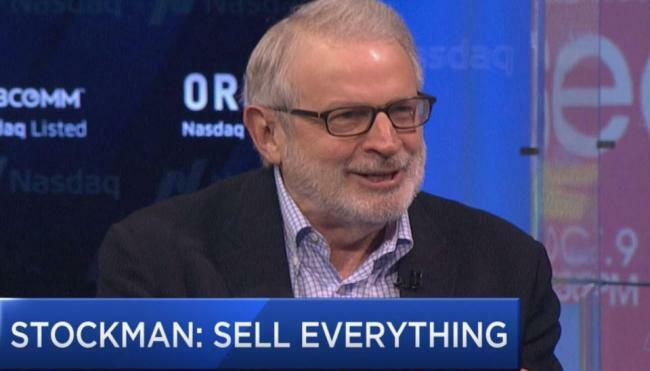 "We're going to be in a recession, and we're going to have another market correction which will be pretty brutal," Stockman said. "[Trump]'s playing with fire at the very top of an aging expansion." For now, all traders can think about is tomorrow - but we suspect Stockman will be right in the end.